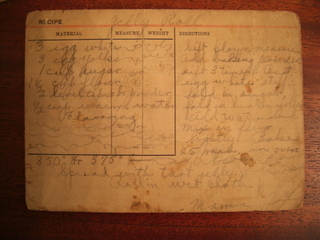 and this handwritten recipe card from someone’s ‘Mama’ – I think it is my great-grandmother’s Mama, but no one can say for sure. 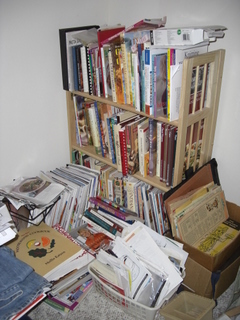 You can see that I have a lot of recipes and I’m always looking for more. I have a worse habit of cookbooks than yarn. I’ve been cooking since I learned how in 7th grade. It is probably no surprise that there are fewer ‘cooking things I learned this year’ and more just recipes I tried. 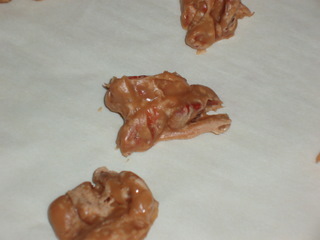 Southern pralines (Martha Stewart Living, December issue – rave), coated some in chocolate, too! 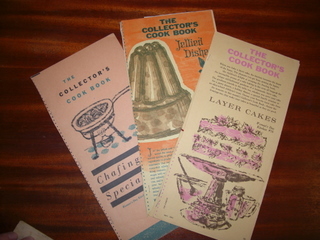 Cooking from my Pantry (the cooking version of Knit from your Stash – rave) -this really upped the ‘creativity factor’ for cooking and eating in the house over the summer. I don’t recall using any different techniques this year, but I have found a few gadgets that I really like and use often. Looking forward, I’d like to try a new recipe each week during the next year. I have a new cookbook (like I need more, ha!) 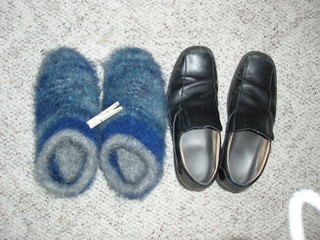 that I got for Christmas from my lovely MIL (Ro’s Simple Pleasures). It is a local cook and book from Paducah. I made some onion soup tonight from it and it was yummy! 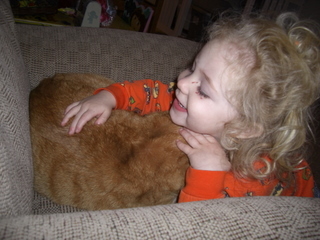 I’d also like to make a gingerbread house with Bug next Christmas. In looking at my ‘cooking life,’ I’ve come to realize that cooking is very much a way to share something with others. In particular, baking allows me to show affection and friendship, but it is also a stress reliever for me when I am upset. It sounds funny, but I bake when I am happy and I bake when I am sad. Finally, what is a post without Bug? I like the idea of looking back on the past year (like Knit Lit and One Hot Stove), but I’m going to put my own spin on things. I knit and do crafty things because I enjoy learning and creating, so here is my knitting reflection. I think I’ll write about my cooking things learned tomorrow…. Well, Christmas has come and gone. 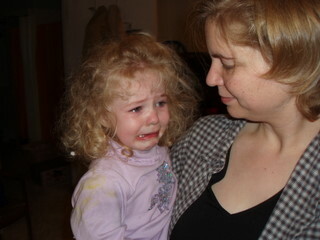 I always feel a little sad after Christmas has gone. I enjoy the “suspending” of real life routine that comes with the holidays. Bug enjoyed her Christmas and seeing her Nana and Pappaw. 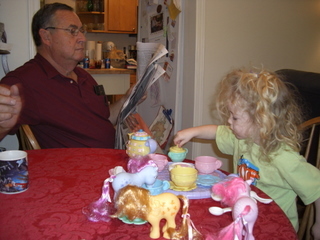 She loved playing with her little ponies and her tea (coffee, to her) set. 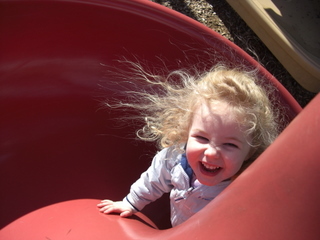 She got the thrill of her life when a lady at the park let her walk a little tea cup chihuahua named Roxie. 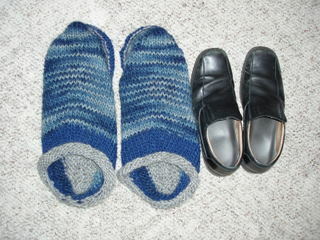 DH liked his socks (first pair ever!) 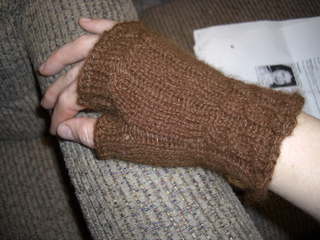 and I finished the fetching wrist warmers. I didn’t give them away, yet. I’m not sure that DH’s sister would have wanted them anyway. 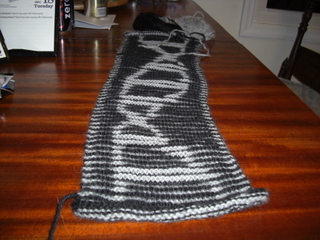 The DNA scarf is progressing, now 46 inches (118cm), but is slow going. I love the alpaca and am probably thoroughly spoiled by the softness of this fiber. 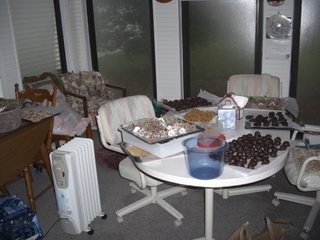 A friend and I meet in Berea at her mom’s house to make Christmas candy each year. It is a wonderful chance to catch up and cook together. Bug’s teachers are the main recipients of my portion of these chocolatey-sugary-buttery confections. 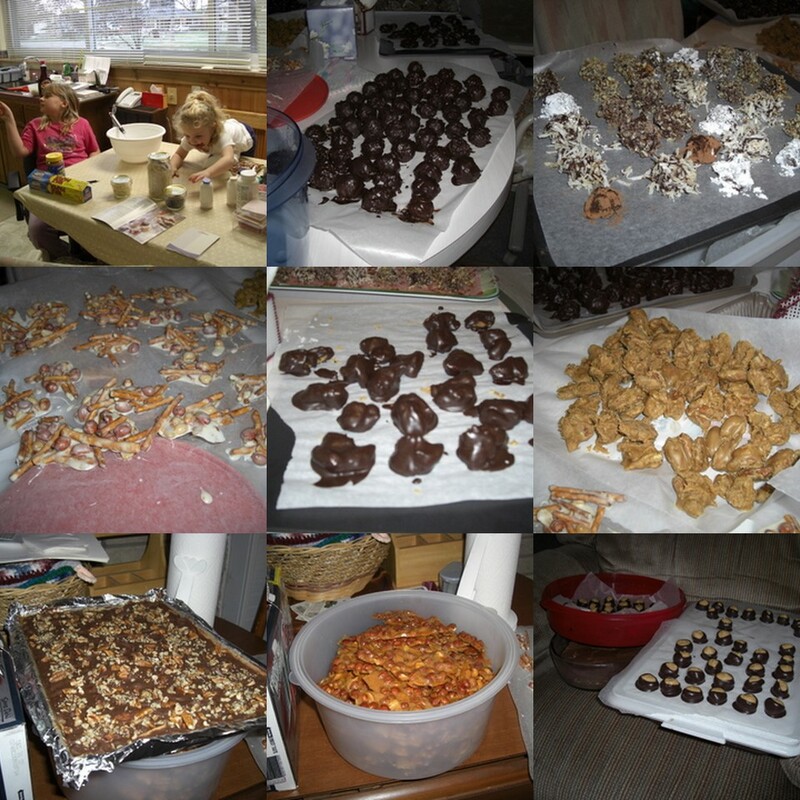 We used almost 10 pounds of sugar (mainly the fudge and the brittle), 3 pounds of butter, 5 bags of coconut, and about 10 bags of chocolate chips. MmmmmMMMmmm! Lots of things going on here. I finished the clogs for DH. 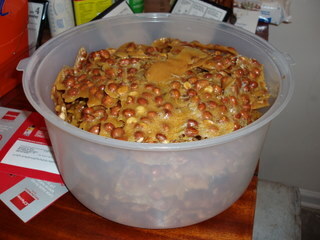 I also made several batches of peanut brittle. It is a wonderful treat to give away. Combine sugar, water, and corn syrup. 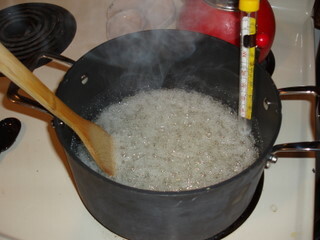 Bring to boil, stirring constantly until the mixture reaches 240F (soft ball). 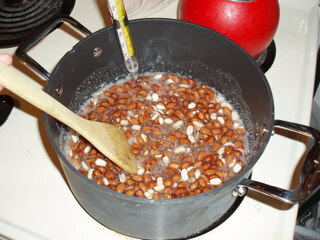 Add peanuts, stir constantly until the mixture reaches 295F. You will begin to smell a “toasted peanut” smell just before it hits this temperature. Remove from heat and add in butter and stir. 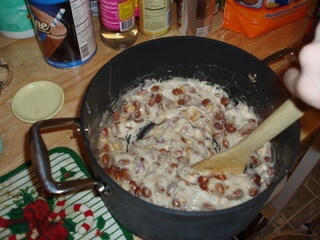 Add in salt and baking powder (mixture will foam). 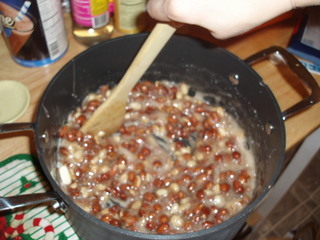 and start to turn a more caramel-like color. 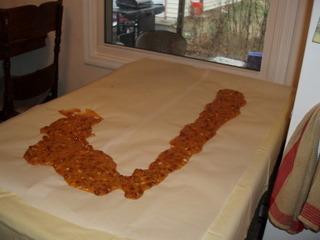 Pour onto parchment paper and let cool a few minutes. 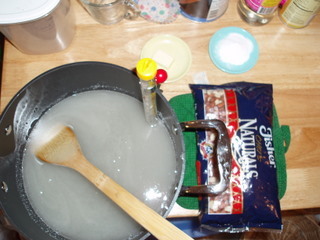 Carefully stretch out the mixture by pulling at the edges. 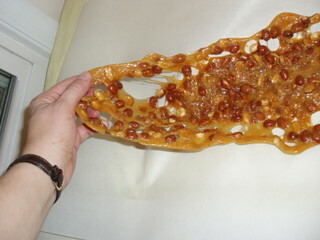 It will be hot, but the thinner peanut brittle is so delicious and not so rough on Grandma’s dentures. Let it cool completely and break it up… Voila! 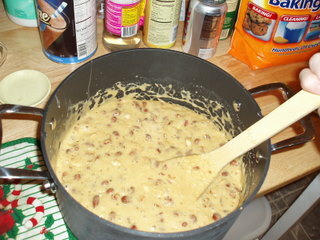 I also tried the a Southern Praline recipe from December’s Martha Stewart Living. It was awesome. They didn’t turn out so pretty, but were delicious. I won’t stir them as long next time. I did some experimenting with the usual truffle recipe. I tried piping the mixture instead of letting it harden as much. It was a bust. 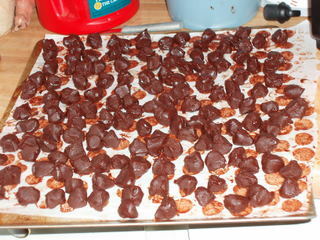 I’ll just have to do it the long way (scooping and rolling the little truffle balls). They tasted fine, but were very soft and small. The chocolate coating also clotted up… boo-hoo. There will be more candy-making this weekend. 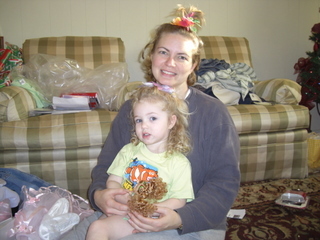 Laurel and I are traveling to Berea to make candy with a friend from high school/college. It is always nice to catch up. My SP is the best SP ever! Bug and I arrived home to find a giant box at the door. It had been a long day of work, then errands. 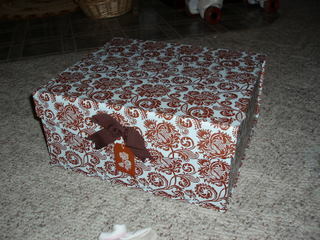 This box was sent by my SP11 pal, author of Coffee Yarn. I actually already read her blog, which I stumbled upon because I was interested in dyeing yarn with coffee. She is the best pal ever. 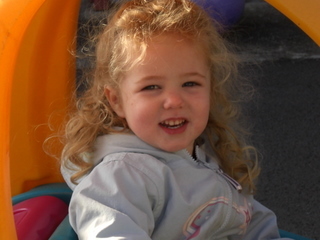 She sent so many wonderful things. 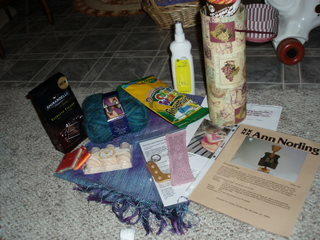 a woven scarf, a knitted bookmark, 2 patterns (one toddler skirt and one vest), yarn (dreamsicle cotton and blue-green mohair blend), espresso-infused dark chocolate, a sock blocker key ring (with tiny pattern) , bath salts, post-it notes, paints and detangler for Bug. I know it may sound strange, but I don’t have many hand-made items. I give them all away and rarely make anything for me. It is very special to have someone make something for me. 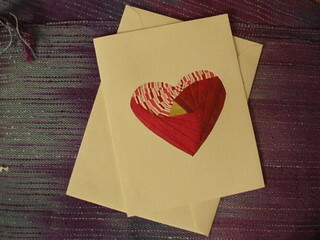 To top it all off, she made this beautiful card! What a thoughtful person she is!!!! I’m not sure that I should even join SP again because I’m sure that no other pal could live up to her… 🙂 Thank you so much! 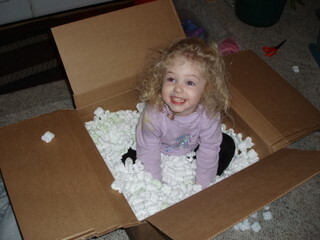 Bug enjoyed every bit of opening the box, opening the presents inside, and playing in the peanuts inside…. 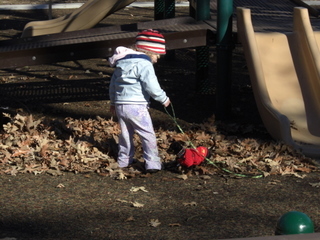 She got very upset when we finally cleaned them up and she couldn’t play in them anymore. 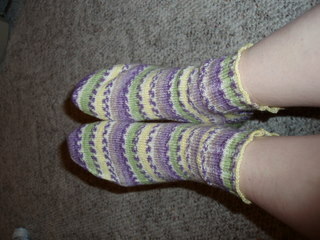 In other news, I finished my socks. 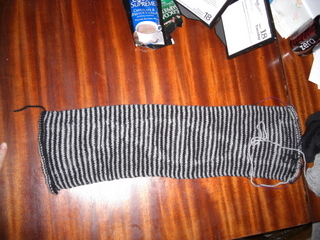 The ends need woven in and washed. 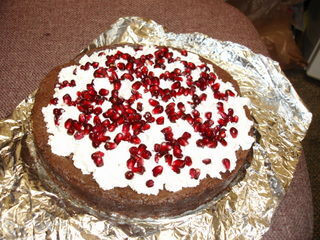 Also, I made Sheri’s Truffle Cake for work except I used pomegranate seeds instead of raspberries for decoration. It was a big hit!